You never know what you will find when you research newspapers. My Grandfather had many, many, many cousins of different ethnic backgrounds. One side from Kauai married Filipino men and thus, the Portuguese and Filipino traditions blended. I found this article about his cousin, Marian. It was in the Oakland Tribune newspaper [Oakland, CA], 12 Nov 1937, page 8B. 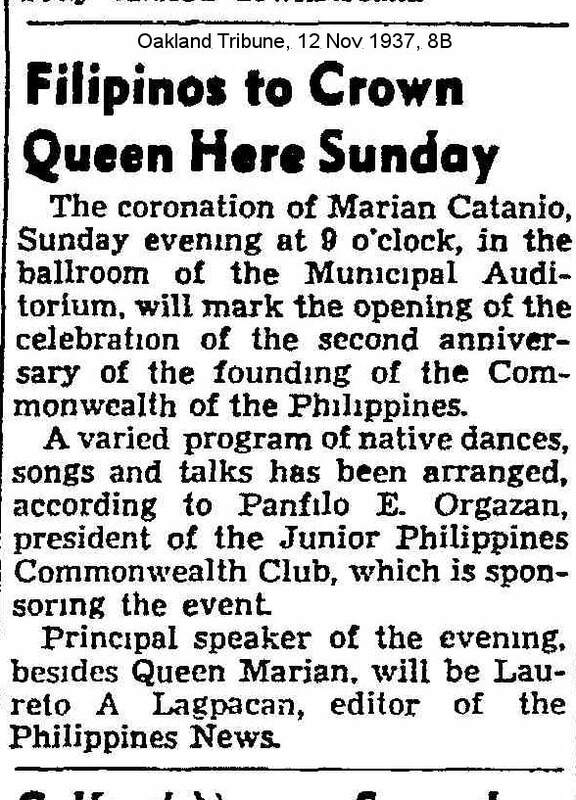 “Filipinos to Crown Queen Here on Sunday” covered a celebration that marked the second anniversary of the Commonwealth of the Philippines. They gained self governing in 1934. The event was held at the Municipal Auditorium in Oakland. The event was sponsored by the Junior Philippines Commonwealth Club. At this event, Marian was crowned Queen. Marian was the daughter of Doroteo Catanio and Rosa Pacheco. She was about 13 years old at the time. There was also speakers, music, and traditional Filipino dances.